A selection of anaca studio's features in the media. Green Mazagine - Issue 62 - July 2018 - Camille sofa here and Emi pod project with The American Hardwood Export Council "Replaced" here. 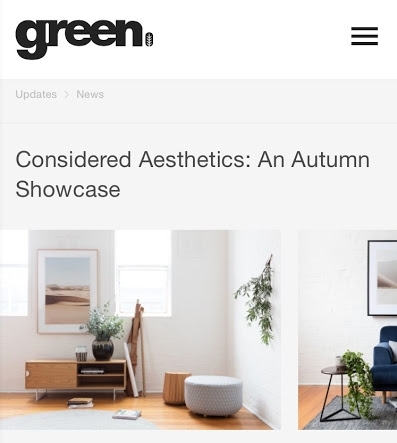 23rd March 2017 - Green magazine - Considered Aesthetics Store. 26 January 2015 - The Design Files - Read the post here. August 2015 - Inside Out "Best buy - Big Cushions"
26 March 2015 - The Weekend Edition - Brisbane - Read the post here. Aug 2016 - Home Beautiful - Featuring our small Coco ottoman. Sept 2016 - Home Beautiful - Featuring our Coco large ottoman. August 2015 - Home Beautiful - "Stand & Deliver"
Selected as part of H&G Style Awards 2012 in the Furniture section. September 2013 - Home Beautiful - "All Natural"